Have you noticed your an abnormal bulge in your horse’s abdomen? Your horse could have a hernia. Hernias are common conditions occurring in horses during birth. Oftentimes, hernias go unnoticed in foals (a young horse), until they have grown. There are two main types of hernias that commonly affect foals. Both types of hernias are defects in the abdominal wall. One type of hernia affects the inguinal canal, while the other type of hernia affects the umbilical area. Each type of hernia will present a different set of symptoms for your horse. Both types of hernias will need to be treated as quickly as possible to avoid causing the horse further health problems. Your horse’s hernia treatment will depend on the type of hernia. Hernias affect most animal, including humans and horses. A hernia is an abnormal opening in the abdomen, which causes a protrusion of organ tissues through the opening. Hernias are typically accompanied with swelling on your horse’s abdomen. Oftentimes, this swelling is caused from the intestine falling through the opening in the abdominal wall. As we mentioned earlier, there are two main types of hernias that commonly afflict horses - umbilical hernias and inguinal hernias. Umbilical hernias typically appear in young horses during the first six weeks after birth. The main symptom of an umbilical hernia is that you will notice a round swelling appearance in your horse’s abdominal area, and feel a ring underneath its skin. At Chaparral Animal Hospital, we will be able to diagnose and treat your horse’s umbilical hernia, as soon as you notice the symptoms. Inguinal hernias occur when the inguinal ring becomes enlarged or weakened. In male horses, these hernias are often referred to as “scrotal hernias,” as they occur around the horse’s scrotum. With an inguinal hernia, you will notice that your horse’s inguinal area, near the groin in females and scrotum in males, will appear swollen. As the hernia develops, the swelling will become more severe. Inguinal hernias can occur in mature stallions, as well as foals. It’s not uncommon for horses to experience scrotal or inguinal hernias after strenuous exercise, like racing and other equine sports. Horses with inguinal hernias often develop colic along with swelling around the intestinal blockage. This can sometimes develop into an emergency situation, causing immediate surgery. Umbilical hernias in horses are a common congenital condition that occurs at birth. Typically, these are caused when an abscess forms on your horse’s umbilical cord or the abdominal wall becomes weakened, causing a hernia. Inguinal hernias are caused by increased abdominal pressure, due to an enlarged inguinal ring or stress during birth. Inguinal hernias are found at the exit and entrance of the inguinal canal. Inguinal and umbilical hernias require separate kinds of treatments. Inguinal hernia are more severe than umbilical hernias, and require more expedient treatment. Umbilical hernias can sometimes reduce after the first few weeks, while inguinal hernias will only get bigger and more dangerous. The only effective treatment for inguinal hernia is surgery, while umbilical hernias are usually okay to heal on their own. However, if you notice that your horses umbilical hernia is beginning to appear larger, you should schedule an appointment with a veterinarian to keep assess the area. During inguinal hernia surgery for horses, the abdominal wall needs to be repaired, and the intestine needs to be replaced. For scrotal hernias, castration is usually required, especially when the intestine is putting excessive pressure on one of the testicles, causing a lack of blood supply to the area. Depending on the size of your horse’s hernia, it can be incredibly dangerous for your horse’s health. As hernias become larger, they put more pressure on the intestine and abdominal contents, which can lead to a lack of blood supply and strangulation. A skilled veterinarian will use careful techniques to ensure that the horse’s intestines are not exposed to contaminants during the surgery. Certain techniques, like hernia clamps and rings are higher risk treatments, because they require larger openings, exposing the area to more contaminants. 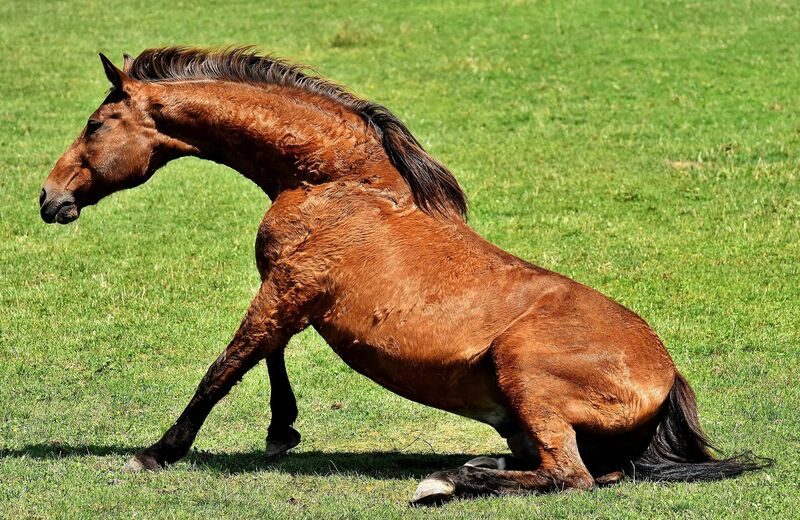 After your horse has undergone hernia surgery, it is important to make sure that your horse is getting a lot of rest, so proper healing can take place. Are you worried that your horse might have a hernia? Schedule an appointment at Chaparral Veterinary Medical Center today at 450-595-8600.